If your GE dryer timer won’t advance the dryer can run for hours causing your electric bill to skyrocket, luckily this dryer repair guide can help. There are two things that can cause this problem so read each section carefully and your dryer will be repaired in no time. The timer is the less likely of the two but you can easily check it without turning a screw on your dryer. 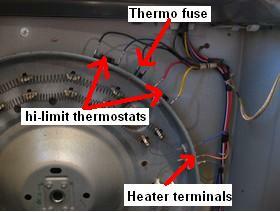 You don’t want to waste your time checking the heating element if the timer is the problem. To check this, turn the timer to a timed cycle say 30 minutes or so then time it. If in 30 minutes the timer hasn’t moved and the dryer is still on, the timer is bad and needs replacing. If in 30 minutes the dryer is off, the heating element is your problem. Timers can be purchased at AppliancePartsPros.com. This is the most likely cause for your GE dryer timer not advancing. GE dryers have two heating elements and if one goes out the timer will not advance if you use it on an automatic cycle but you will still feel heat inside the tub. Note that if your dryer is not heating at all click here. 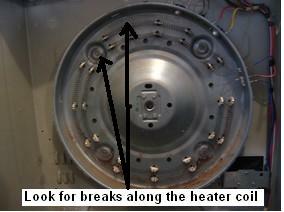 To check the heating element first, disconnect power from the dryer. Then take the top off by removing the two screws in the door (the two pointing up) and lift up the top. Now remove the front by removing the screws inside the case (pointed toward the front) and lifting the front upward. You should be able to leave wires going to the door switch plugged in and move the front to the side. Next, remove the tub by unhooking the belt by pulling the idler pulley toward the motor which should release the tension from the belt then you should be able remove it. Then the tub just slides out toward the front. Once the tub is out you should see the elements, look to see if one of them is broken. Normally if you can’t see it broken then its not bad but you can check it with your ohmmeter to be sure. To do this first unplug the wires. If the heaters are good you should have continuity between the common (the terminal that connects one end of both elements) to both of the other terminals. If you don’t have continuity between both terminals, replace both of the elements. Heating elements can be purchased at AppliancePartsPros.com. After you complete this repair make sure the vent is working properly because a clogged vent can cause the elements to go bad.